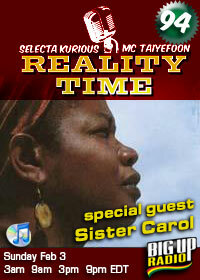 Sister Carol, born Carole East, is one of Jamaica’s top entertainers. Having been born and raised in the ghettos of Kingston till the age of 14, her family immigrated to Brooklyn, NY in 1973 to look for work. Who knew that the thriving dancehall scene in New York City in the 70’s would lead Sister Carol to a path that would include movies, albums, television appearances and a Grammy nomination for her highly regarded 1996 release, Lyrically Potent. Music has always been close to Sister Carol’s heart. In fact, her father was an engineer that worked in radio at RJR in Jamaica and would regularly be part of the music scene that was being established in the 1960’s by Studio One’s legendary Clement "Coxsone" Dodd. These early influences came into play when Sister Carol began her musical career, following in the footsteps of one of her mentors and friend, DJ Brigadier Jerry. Having won talent contests in both Jamaica and New York, Sister Carol was offered an opening slot for one of Jamaica’s finest vocal trios, The Meditations, who had provided harmony vocals for Bob Marley. Bringing her greater recognition and a wider audience, as well as firmly establishing her as a cornerstone of the dancehall/dj movement, this opportunity opened the door for her to record her first two records, Liberation for Africa and Black Cinderalla. Sister Carol also began another facet of her entertainment career as an actress, appearing in two Jonathan Demme movies, Something Wild and Married to the Mob.